Pharmaceutical residues are considered as emerging environmental problem because of their potential toxicology risk on living organisms. Environmental problem of pharmaceuticals are persistence to the aquatic ecosystem even at low concentrations (µg/L-ng/L). Conventional wastewater treatment plants are not enough to remove an emerging solution. Ibuprofen (IBF), a non-steroidal anti-inflammatory drug (NSAID), is a most widely used medicine in almost part of world. In present study, under laboratory conditions, coagulation followed by advance oxidation, using H2O2 and FeSO4 (Fenton process) is used to degrade the concentrations of ibuprofen from water were conducted. Fenton process is known to be most effective and common methods for the treatment of such wastewaters. In the present study H2O2 was used with FeSO4 for the treatment ibuprofen and effects of H2O2, FeSO4 concentrations COD and TOC removals. Experiments with optimal concentrations of H2O2 and FeSO4 were carried out by chancing pH, temperature, stirring and residence time of solution (2-6), room temperature, (10,20,30 min) and (30,60,90 min) respectively. Concentration of FeSO4 and H2O2 were selected as (30,75,150 mg/L). After processing, 150 ml of samples taken out from the upper layers of sample COD and TOC tests were conducted.
.	V. Kavitha, K., Palanivelu, “The Role of Ferrous Ion in Fenton and Photo-Fenton Processes for the Degradation of Phenol,” Chemosphere, vol 55, pp 1235-1243, December, 2003.
.	C. Wailling, “Fenton’s Reagent Revisted, “Accounts of Chemical Research, vol8, pp 125-131, April, 1975.
.	T. Scheytt, P. Mersmam R., Lindstadt and T., Heberer,” 1-Octanol / Water Partition Coefficients of 5 Pharmaceuticals from Human Medical Care: Carbamazepine, Clofibric Acid, Diclofenac, Ibuprofen and Propyhenazone,” Water, Air and Soil Pollution, vol 165, pp 3-11, March, 2005.
.	G. Sonmez, “Removal of some pharmaceutical residues by advanced chemical oxidation process”, Aksaray University, Science Enstitue, November, 2015.
.	S. Ustun Odabasi, B. Maryam, H. Buyukgungor, “Assessment and Investigation of Paracetamol from Wastewater By Using Oxidation Process and TOC,” 3rd International Conference on Recycling and Reuse, 2015, pp161-166 .
.	Y.W. Kang, ve K.. Hwang, “Effect of reaction conditions on the oxidation efficiency in the Fenton process”, Water Research,vol 10, pp 2786-2790, Jully,2000. ISNAD Ustun ODABASI, Sevde . "Investigation and Evaluation of Degradability of Ibuprofen from Wastewater by Using Fenton Process". 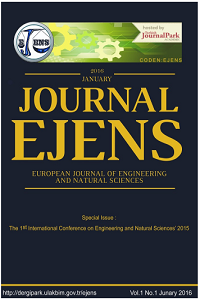 European Journal of Engineering and Natural Sciences 2 / 1 (February 2017): 114-119.